It’s the time of year fresh fruits and vegetables are at their best. One of the best things about Spring and Summer is the abundance of fresh fruit and vegetables. Unfortunately, preparing the fruit and veggies to eat can sometimes prevent us from actually incorporating them into our diets. I’m embarrassed to say that I’ve had produce rot a time or two because of my pure laziness. With so many people in need, I do NOT want to waste food. 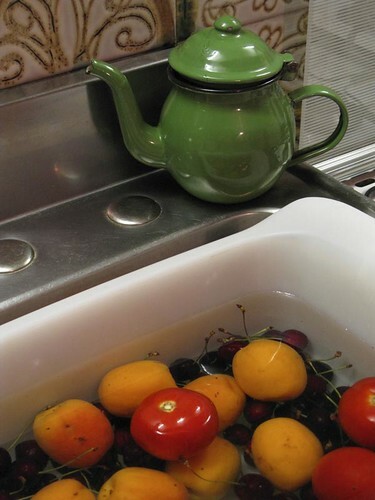 Prepare fruits and vegetables by washing them. In order to combat my lazy attitude towards preparing fruits and veggies, I’m going to let you in on a little secret my friend Jackie told me. She’s a master gardener and in the dirt all the time so she knows what she’s talking about. When you get home from the store or market, dump all of your fruits and vegetables in the sink. Cover with cold water. Then add 1/4 teaspoon of bleach for every gallon of water. Let it sit for a few minutes, and then rinse well. Rinse again. Store as usual. When she first told me about this tip, the thought of using bleach just totally freaked me out. It still kind of does. However, it’s only a teeny, tiny amount and I rinse thoroughly until I think there can’t possibly be a trace of it left. Guess it’s the battle of bleach vs. dirt and germs accumulated during transportation. Washing the fruits and vegetables is just half the battle, though. Now, I just need to find someone who will peel the oranges, cut up the strawberries and tear the lettuce! Now it’s your turn to tell us what you’ve been cleaning this week. Link up and share a tip (or just brag on your little ones)! 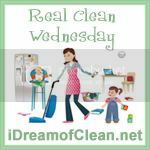 Grab a button and/or link back to Real Clean Wednesday. Link directly to your post (not your website) so it will be easy for people to find your post in the future. When you add your post to the linky, please add your name and a description of your post. Visit others give them some comment love! I have never heard of using bleach to clean produce. And the fruit keeps for awhile? Yes, the veggies do great once they are washed! I don’t think it really changes how long the fruit stays fresh, though. I’m going to have to try this as I have to admit, too, that I have let some produce rot. 🙁 Thank you for sharing! .-= Sherry´s last blog ..Breaking out of a reading rut & a Giveaway =-. I hate cleaning fruit, too! Love this tip…little afraid about the bleach factor, but if you say it works, that’s good enough for me! I have a tip on keeping a head of lettuce fresh longer. My Mom told me to wrap it in paper towels (I usually unroll a strip of 4-5 and roll the lettuce up in it). I thought she was nuts at first, but I tried it and can’t believe how long a head of lettuce lasts in my fridge. The paper towels absorb any extra moisture and keeps the lettuce nice and crispy! You’ve inspired me to tackle some jobs that I have been putting off for years. Yesterday I tackled the deposit left on my refridgerator drink dispenser and the tray underneath, It was disgusting! My kids always pull their cup away too soon and don’t dry the tray and little by little, the drips and water spills added up. It looked like the plastic was actually pitted and I didn’t know how to proceed. I’d tried bleaching it which helped with the color, but not the layer of buildup. I finally tried CLR (calcium, lime & rust remover) because I figured it couldn’t look any worse, and with a little elbow grease, it looks like new. I am now kicking myself for not trying this sooner. Now I know what to do and won’t wait so long next time! Isn’t it funny how simple things bring such joy?!! I am planning on doing more of your spring cleaning tips every day so I can get this house under control…thanks for all your great ideas and timesaving tips! That’s a great idea for the lettuce! I’ve never heard of that. I actually have some now so I can try it! Oh, and I’m SO glad you’re spring cleaning! It is so true that the little things can make such a big difference. I’ve put off a few of those myself : ) Now you’ve inspired me to tackle a few of them! Oh, I’m so glad! Thank you for linking! !